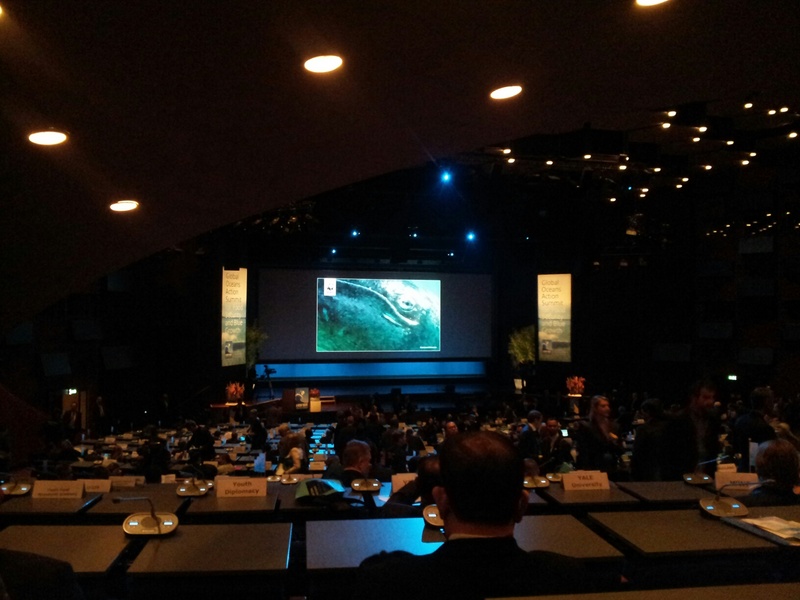 Last week I attended the Global Oceans Action Summit for Food Security and Blue Growth; held at The World Forum in The Hague (the Netherlands). It brought together 500 ocean stakeholders from over 80 countries to address the three key threats to ocean health and food security; overfishing, habitat destruction and pollution. The summit also highlighted the challenges facing the creation of integrated solutions combating these threats in terms of public-private partnerships, funding and the need for good ocean governance being balanced with the growth, sustainability, conservation and private sector interests. 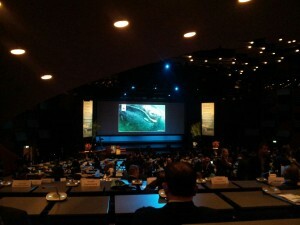 The plenary session of talks, including a presentation by H.E. Sharon Dijksma, Dutch Minister for Agriculture, and the Chair of the summit, were interspersed with some interesting performances; notably the oceanic reworded renditions of The Snowman and Circle of Life from the Lion King which were accompanied by laser displays. The speakers highlighted the need for focused efforts on the oceans because over one billion people worldwide derive their food and livelihoods from them, 40% have world’s countries have more ocean than land under their jurisdiction and 13 of the world’s megacities lie on the coast. We heard how the oceans are currently under pressure from multiple sources including dead zones, disappearing ecosystems, ocean acidification and sea level rise. One third of fish stocks are over exploited and so restoring fish stocks could create $50 billion annual economic gain. One thing that surprised me is that 40% of the world’s fish catch is currently used to feed farmed fish (aquaculture). In addition I attended a variety of parallel session discussions. One session focussed on the concept that the ocean is a complex, moving and 3D environment; and we need stop applying current land management principles to the ocean; instead we need to better understand them and manage them as oceans. Other sessions highlighted the need to engage with the local community rather than imposing outside solutions, as 80% of aquaculture production is by SMEs. A strong theme coming out of the conference was that greater recognition was required on the negative impact of climate change on the ocean, and local adaptations will not offset this. Whilst a number of partnerships and principles were announced at the Summit, we are long way from solutions. The next World Ocean Summit will be in June this year, but we need global, and local, action now to achieve healthier oceans and fish stocks for the future. Is This The Worst Global Coral Bleaching Event Ever? This entry was posted in Oceans, Policy, Uncategorized and tagged climate change, fish stock, Global Oceans Action Summit, habitat destruction, ocean, ocean health, overfishing, pixalytics, The Hague by Sam. Bookmark the permalink.